This is not a photo of me, but this is the face I make when I’m excited about food, including donuts (or doughnuts, whichever spelling you prefer). And yes, my favorite donut is still the frosted kind with sprinkles as shown here. When my husband found this photo online (or on Istagram), it stopped him in his tracks, and all I heard was: “This is YOU!” as he began to chuckle. This photo made me chuckle too and I had to agree with him because he was right – this is the face I make. What can I say, food makes me happy and I get excited about it. 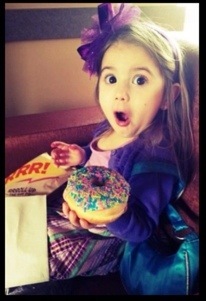 When I learned that today is National Doughnut/Donut Day I remembered this picture and I got to thinking about donuts. Ok, I’ll be honest, I got to dreaming about donuts. Dreaming of all the places where I’ve had donuts that are unforgettable and the one summer my great-grandmother made donuts with us from scratch (I have not made them as an adult from scratch, and now I have my next baking project). 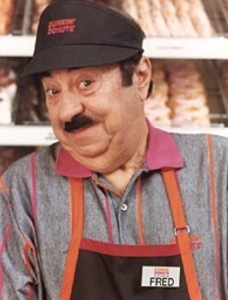 As a kid, my association with donuts was with this guy, Fred. Do you remember him? “It’s time to make the donuts,” was Fred’s catch phrase, and his fun commercials for Dunkin’ Donuts always made me laugh as a kid (you can watch one here). 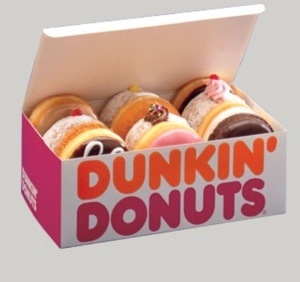 The donuts I ate as a kid were Dunkin’ Donuts, and they are still my favorite; when I indulge in a donut, this is where I am buying one (if you visit them today, Dunkin’ Donuts is giving you a free donut with any beverage purchase). When I was growing up, these small compact boxes would guarantee a delicious donut. We didn’t eat them often, in fact, it was my best friend’s mother who used to bring home several boxes of these on Sundays mornings. So if I was visiting or had a sleep-over from the night before, my BFF and I would enjoy a donut or two for breakfast; we weren’t coffee drinkers yet at that point. The box has changed to prevent the donuts from sticking together due to their frosted tops, but there was something about this box and pulling out a donut on a Sunday morning with my friend that makes me nostalgic for a donut.